About two weeks ago, a book that had been on my wish list for a long time finally arrived at my house. Chapter 2 is about design principles and elements, such as line, shape, color, texture, pattern, balance, proportion, rhythm, emphasis, harmony, and unity. There are runway pictures and drawings in abundance to illustrate the concepts. 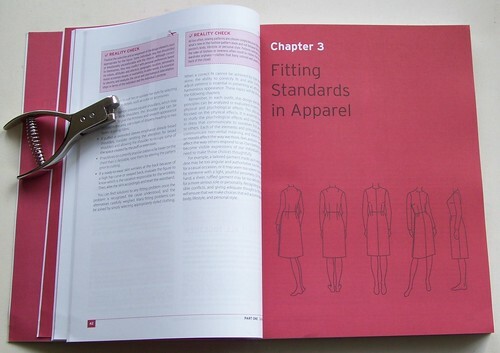 In one of the Reality Check boxes (see the red boxes on the left page in the picture above) that are interspersed throughout the text, the authors offer the following insight: “Patterns selected only for the sake of fashion or newness often result in clothes that become wardrobe orphans – clothes that hang unloved and unworn in the back of the closet.” Raise your hand if you’ve been there done that. 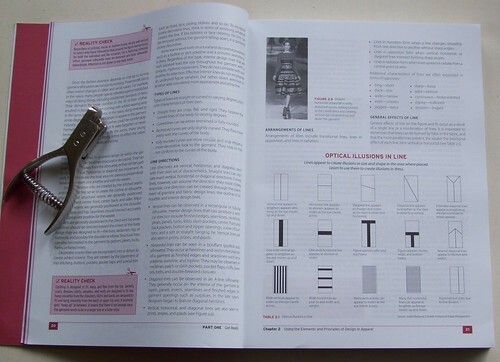 Chapter 3 offers the reader multiple methods for evaluating fit: structural line (silhouette, seamlines, closures, etc), grainline (lengthwise and crosswise; perpendicular or parallel to the floor as intended), ease (wearing and design), pinch test, measurement (from existing comfortably fitting garments), and wrinkles. The word “method” seems to imply using one or another, though in reality we’re often using a combination of several methods simultaneously. Just think about fitting a sleeve – you may pinch it to see if there’s enough ease, look at the marked grainline to see if it hangs properly, and see where wrinkles, if any, are forming. 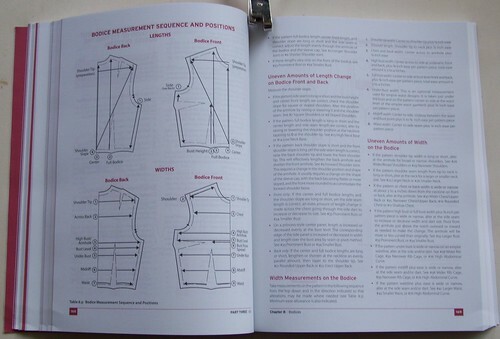 This chapter also includes two tables detailing the standards for fitting. 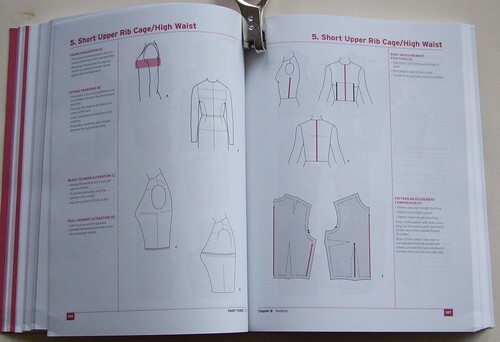 The first one is for the basic fitting garment while the second one is for fashion garments (both sewn and RTW). 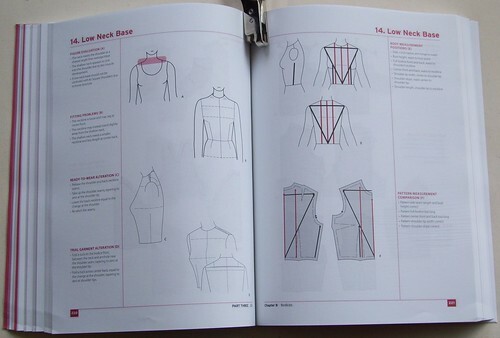 The second table addresses fit and appearance of the garment at various points from the neckline down and includes such gems as “Underwear is not visible”. I wish people didn’t need to be reminded of such basic concepts. 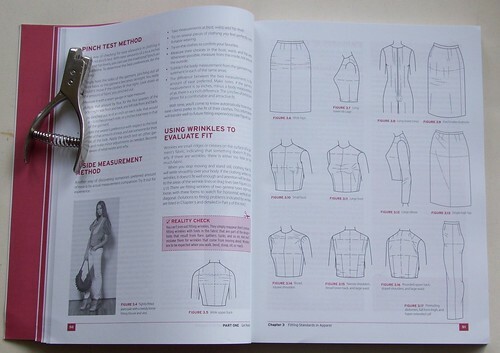 Chapter 5 is a discussion of the various fitting methods – measurement, tissue fitting, and muslin fitting – with a solid analysis of their relative advantages and disadvantages. 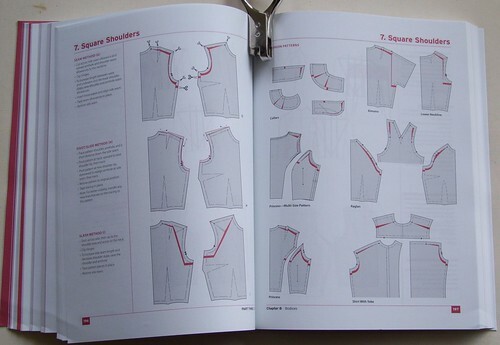 Chapter 6 is a discussion of the various pattern alteration methods – seam method, pivot and slide, and slash method. 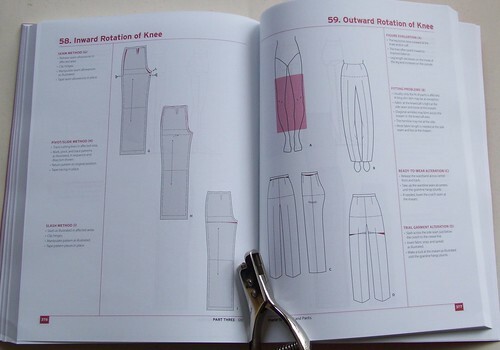 It includes an extensive section on altering the pant crotch curve with clear illustrations and text. 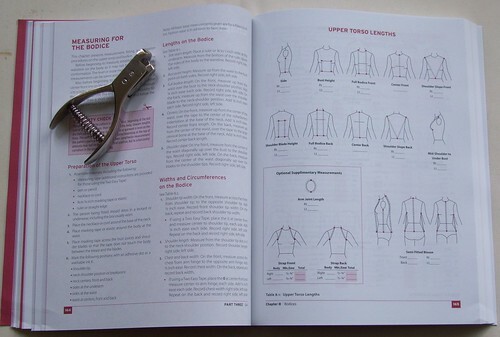 Chapter 7 is a quick discussion of personalized patterns and slopers – checking them for accuracy, using them to determine how to alter a fashion pattern, and designing new patterns from them. You know how most of the Big 4 patterns have a shorten/lengthen line somewhere below the armhole? And you know how it totally works for some people but others have to shorten through the armhole as well? And some need just a shorter armhole but leave the rest of the length be? As it turns out, there’s a good reason for that. Here, the bodice is too long below the bust. 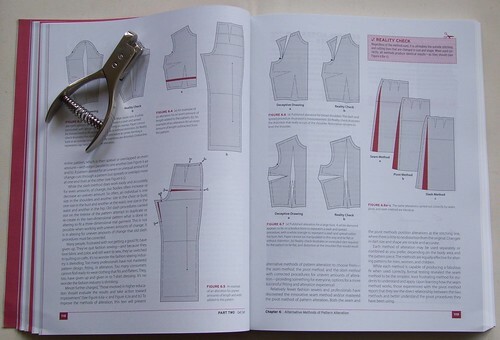 Here, the bodice is too long between the armhole and the bust. And here, the extra length is above the bottom of the armhole. Notice how for each figure variation, there is a picture with the affected area highlighted in red. 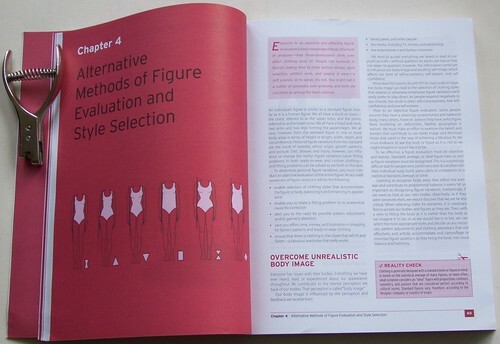 This is the figure evaluation picture (A) and there is text that goes with it on the left. Then there is the fitting problems picture (B) that shows how the garment would look on a person with this figure variation and the text describes issues observed. 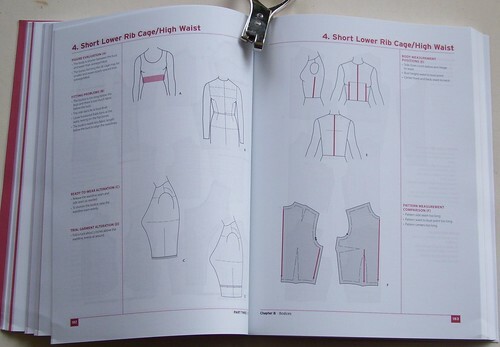 Picture C and its text show how to alter ready-to-wear, while picture D and its text show the alteration for the muslin garment (which you can later transfer to your pattern). 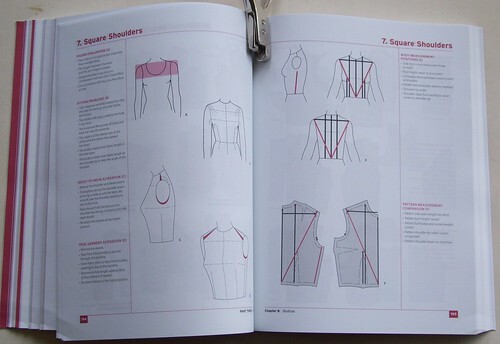 On the facing page, pictures E and F show lines on the body and on the affected pattern pieces that represent measurements: black lines are the measurements that are correct, red lines are those that need to be corrected. The text again helps clarify the visual. So let’s say you have square shoulders. 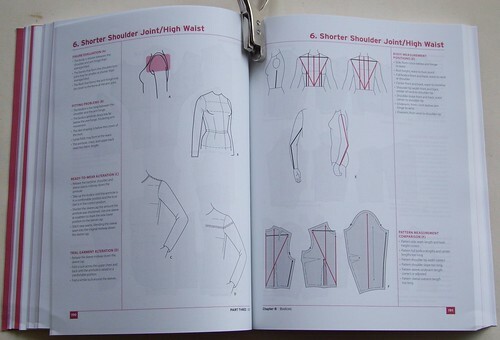 You would turn to this page, compare the wrinkles you see to the picture, and verify that your pattern’s length is correct everywhere except the too short measurement from CF at the waist to shoulder point. Pick your favorite alteration method and follow the instructions on the left. The instructions are clear and the pictures help those of us who need to see how things should look. 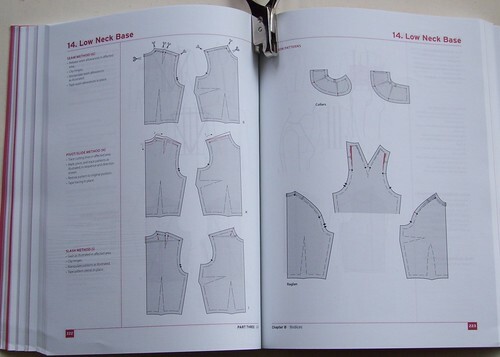 Notice that the right page shows how collars will need to be altered as well. That you will need to alter facings goes without saying. 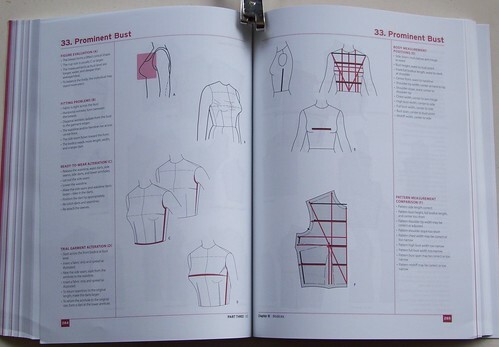 The nice touch here is that alterations for a specific figure variations are grouped together on the same page so you don’t have to frantically page through the book looking for the section about altering a blouse with princess seams or a kimono sleeve. OK, so back to those square shoulders. Remember how I said your pattern’s length should be correct everywhere except the too short measurement from CF at the waist to shoulder point? What if you’re like me and it’s the other way around? What if the measurement from CF at the waist to the shoulder point is correct and even the bust point is where it’s supposed to be but the neckline is up in the air because your pattern’s CF is too long? Well, no square shoulder alteration for you! 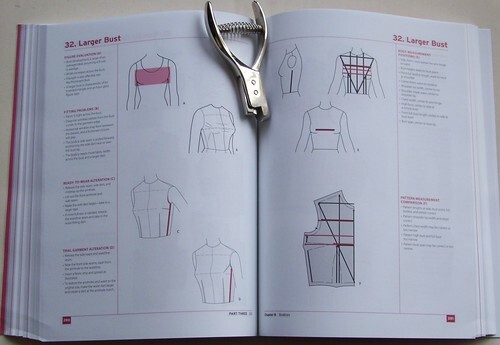 Easy-peasy, and it certainly beats doing a square shoulder alteration only to discover that now the pattern’s bust point is saying hello to your navel so you’ll have to shorten it somewhere else which may result in yet another unexpected problem. It’s better to just focus on where the issue really is and fix it. I have to say that this is an alteration I have not seen in a fitting book up until now. I have been using it without knowing what it was because I had found it in one of my vintage 50’s magazines for dressmakers. It’s in German and it had to do with RTW altering (I think) but they had pictures and I liked them. See how they say “inward rotation of knee” instead of calling it knock-knees? And see how bowed legs became “outward rotation of knee”? They also have inward and outward rotation of elbow but I didn’t even know such thing existed, let alone what the less-than-kind terms might be. There is only one way I can think of to improve this book and that is to give it spiral binding so that the notcher doesn’t have to double as a paper weight. So this afternoon, I’ll go to Office Max and have the book spiral-bound. 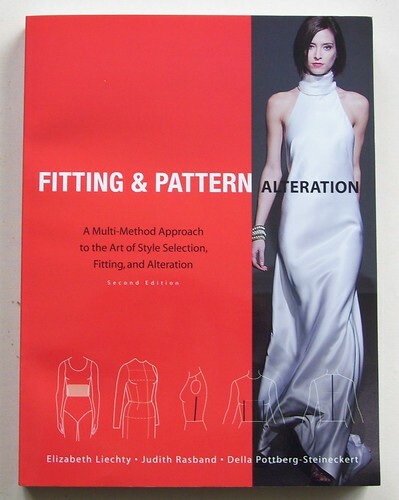 This is the most comprehensive fitting and alteration resource I have seen to date (and you should see my library of fitting books), with clear instructions and pictures (lots of them). You can pick your favorite alteration method or use a combination of several – the pictures will guide you. You don’t even need to be very familiar with any specific method as they are all explained in chapter 6. At over $90, the book is expensive but well worth the money. And now, over to you, dear readers: do you have this book? Is it on your wishlist? 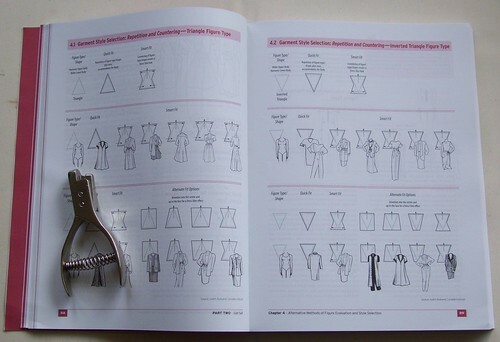 Or do you have a different favorite, in which case – what is your favorite fitting/pattern alteration book?